Cherry tomatoes create an attractive hanging basket, especially if you add nasturtiums to brighten the pot. Not only are they pretty to look at, having juicy round fruits at your fingertips encourages snacking on healthy foods all summer. Soil mixture: Mix equal parts potting soil, moist peat moss and perlite in a large containers. Spray to moisten and mix thoroughly. Add one teaspoon of lime to offset the acidic nature of peat moss. Adding all purpose fertilizer at this gives your plants a good boost. Follow the recommended application rate in your fertilizer. Mix all ingredients well. Planting: Fill the hanging basket ½ to ¾ full with soil. Remove the tomato seedling from the pot and position it in the center of the hanging basket. Fill in around the roots with fresh soil mixture and firm it down to secure the plant. Continue to fill the container to within 1 inch of the top. Don't worry about covering the stem of the plant as new roots will form along the stem providing additional support. Add flowers or herbs: Plant nasturtium seeds to a depth if ½ to 1 inch spaced four to six inches apart around the perimeter of the basket. These plants will soon sprout and grow over the sides adding color and texture to your basket. Some prefer to add an herb or two, depending on the size of the basket. Miniature basil or creeping thyme works well. Location: Hang the basket in an area that receive full sun for 6 to 8 hours a day. Watering: Water your newly planted basket until water runs freely through the bottom of the container. Repeat whenever the soil feels dry to the touch. The amount of water needed depends on the weather and growth rate of your plants. Typically, tomatoes grown in containers require daily watering. 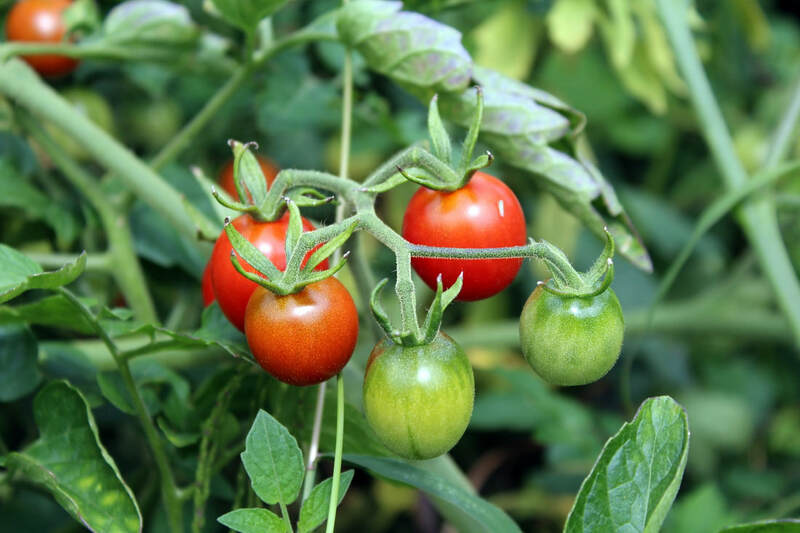 Fertilizing: Apply water-soluble fertilizer to your tomatoes on a 10 to 14 day schedule. Because nutrients are easily leached from the soil when plants are grown in containers, replenishing nutrients is necessary for proper growth. I prefer Miracle Gro, but there are several other options. Harvesting: Harvest cherry tomatoes as soon as they are ripe by plucking them from the stem with your hands. Use care not to damage the stem when picking the tomatoes. Serving: Add cherry tomatoes to garden salads or serve with low fat dip. They also make a colorful addition to kabobs cooked over the grill. Although cherry tomatoes can be sauteed or grilled, try placing a big bowl of these little gems on the counter to tempt kids and adults. Their flavor is more intense when served at room temperature - but if you wish to keep cherry tomatoes for more than a few days, place them in the refrigerator in a perforated vegetable bag.